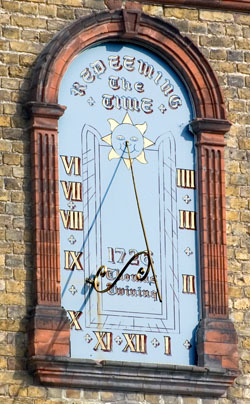 This type of sundial is known as a vertical dial and the enthusiast would describe it as a vertical, declining dial because it does not face due south. Such dials are said to be declining so many degrees east or west of south, so that the gnomon, the rod that casts the shadow of the sun, is angled to one side or the other of the vertical centre line. 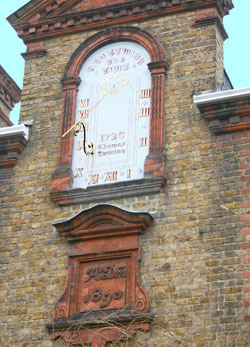 For the same reason, the hour markers are not quite symmetrical, starting in this case, after 6 o'clock in the morning and ending at 4 o'clock in the afternoon. The perfect south-facing dial would start at exactly 6am and end at 6pm. The original dial would probably have been cut in stone and been very plain. It might well have had the present inscription. The dial seen today almost certainly dates from when the house was extensively restored and altered in 1890-91. 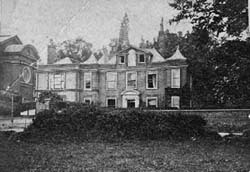 An early photograph of about 1860 shows that there were at that time two small windows flanking the dial in a combined 'dormer' together with a larger central window at first floor level. 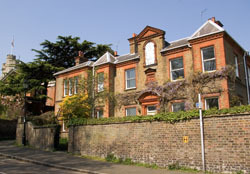 The alterations involved narrowing the dormer, lowering the dial and replacing the large window with a date plaque. The 'framing' of the dial is quite pronounced and Victorian in style, suggesting that the replacement was specially made for this position. The dial has probably been repainted several times in the last 115 years and the sharp-eyed will note that the hour marker lines in the region of 10 o'clock to 2 o'clock are not quite directed to the 'centre' of the dial which is at the root of the gnomon. Note too, that some of the intermediate 15 minute markers are missing between 1 and 2 o'clock. from text contributed by Douglas Bateman, The British Sundial Society. The British Sundial Society has a helpful website covering the huge variety of forms.